Seven Soldiers Book Now Out! | Sci-Ence! Justice Leak! Seven Soldiers Book Now Out! 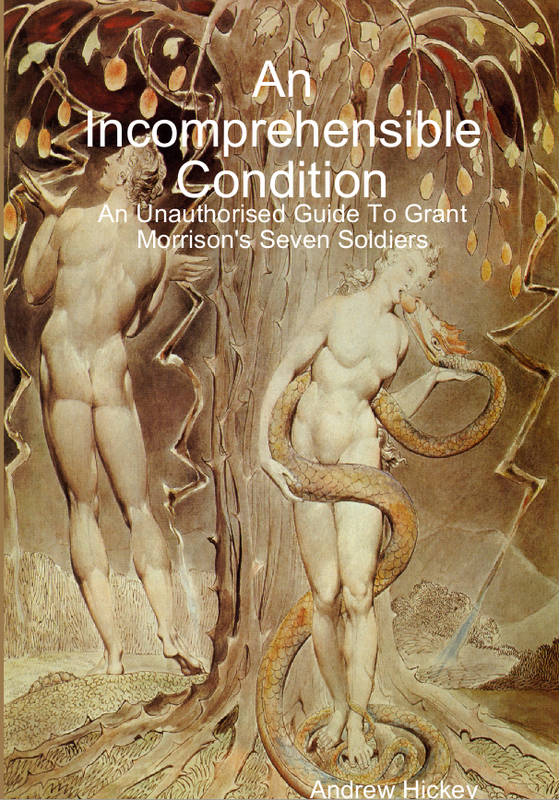 My new book, An Incomprehensible Condition: An Unauthorised Guide To Grant Morrison’s Seven Soldiers is now available in paperback or PDF and hardback from Lulu.com . The various ebook formats should be uploaded tomorrow night. In An Incomprehensible Condition, Andrew Hickey examines Grant Morrison’s 2005 comic series Seven Soldiers of Victory, and traces the history of the ideas used. From Greek myth to hip-hop, from John Bunyan to Alan Turing, from Arius of Alexandria to Isaac Newton, we see how Frankenstein connects to Robert Johnson, what George Bernard Shaw had to say about Bulleteer, and what G.K. Chesterton thinks of I, Spider. As always with my print books, I don’t yet have a paper proof copy, so caveat emptor. It’s only a short book, but it’s very dense. Please don’t let the low page count fool you – this is a book that will take time to read. This entry was posted in books, comics and tagged an incomprehensible condition, mememememe, my books, seven soldiers. Bookmark the permalink. 13 Responses to Seven Soldiers Book Now Out! I’ll be doing the Beach Boys review tomorrow, with luck. Spent Saturday and Sunday proofreading and re-writing this book. Today am finishing proofing my uncle’s book and finishing an interview with Plok for his blog. Tomorrow writing a post about the Monkees (also referenced in both my book and Morrison’s) for Liberal England, the Beach Boys post for here and uploading the ebook versions of my new book. Is “Surfin’ USA” the only song he sued the Beach Boys for? Interview’s up at my place! I can’t remember whether you ever said anything about the title of this book? Where it’s taken from, what it means. I used the quote, from Chesterton — “In the fairy tale, an incomprehensible happiness rests upon an incomprehensible condition. A box is opened and all evils fly out. A word is forgotten and cities perish. A lamp is lit and love flies away. An apple is eaten and the hope of God is gone.” — as the book’s epigraph. OK, good, that’s what I’d forgotten. I ask because I’m re-reading Orthodoxy and the title-phrase took me by surprise when I stumbled across it. Odd — I’d always thought of “condition” in your title meaning “state of things”; now I realise it means “requirement”. I liked the fact that, out of context, it could mean both. Being both a scientist and a Christian, I agree entirely!